The cheesemakers of Ireland sure do know how to put on a hooley. The cream of the crop gathered on a dark November night at the Grainstore in Ballymaloe House to announce the 2015 Irish Cheese Awards. It was a glamorous event, black tie – with colourful trousers! – and clickety-clackety high heels, a far remove from the hands-on hard work that these women and men do every day to create the glorious cheddars and blues and washed rind cheeses that grace your plate. A total of 145 cheeses were judged. That was 145 cheeses that simply did not exist in Ireland 40 years ago, before the revival of Irish farmhouse cheesemaking was sparked by Veronica Steele. Based on the Beara Peninsula in West Cork, Veronica and her husband, Norman, started making cheese in 1976, and passing that hard-won knowledge on to others. In a world where industralised, highly processed “cheese” like Calvita was the norm, the Steeles’ superb Milleens was a standard bearer for a new generation of cheesemakers. That night, Veronica was presented with a lifetime achievement award to acknowledge her immense contribution to the Irish farmhouse cheese industry. There was applause. There was a standing ovation. There were tears. And there was cheese. Let there always be cheese. 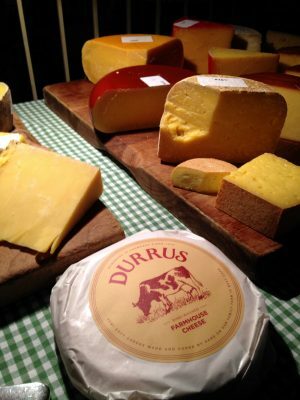 Gloriously different, intensely flavoured, immensely enjoyable Irish farmhouse cheese. Mount Leinster Clothbound by Carlow’s Coolattin Chedder was named the Supreme Champion at the Irish Cheese Awards 2015; it, or any well flavoured Irish cheese, works in this simple supper dish. I’m using prosciutto, a dry cured Italian ham, here but also worth trying are thin slices of North Cork pancetta from McCarthy’s Butchers in Kanturk. Serves 6, as a light supper – or 3 hungry people! Preheat oven to to 180°C/160°C fan bake. Using a little olive oil and a pastry brush, grease the insides of 6 cups of a muffin tin. Line each cup with a slice of prosciutto. 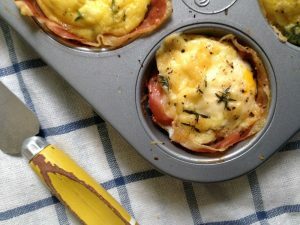 Break an egg on top of the prosciutto, divide the cheese between the cups and sprinkle with thyme or marjoram leaves and black pepper. Bake for 12-14 minutes, depending on how done you want your egg. Remove carefully from the tin and serve with some good chutney and lots of hot, buttered toast.